Many protected areas are badly suited to overcome climate change–induced shifts in species’ geographic ranges. Studies show that protected areas “have not been designed for efficient (or even complete) representation of species” (Hannah et al. 2007). Fixed protected areas alone will not be sufficient to safeguard biodiversity from the impacts of climate change. Hannah et al. show that between 6% and 22% of species in their analysis failed to meet representation targets for future ranges that take into account the impact of climate change, with a further increase expected under more severe climate change scenarios. Connectivity measures, such as the creation of corridors or stepping stones compensate for such losses. This is also reflected in the Millennium Ecosystem Assessment: “[c]orridors and other habitat design aspects to give flexibility to protected areas are effective precautionary strategies. Improved management of habitat corridors and production ecosystems between protected areas will help biodiversity adapt to changing conditions” (MEA 2005). A combination of several measures (enlarging areas, securing robust large areas, securing ecological connections between areas, and establishing real ecological networks) therefore seems to be the best approach to maximize the ability of nature to cope with the pressure of climate change on biodiversity. 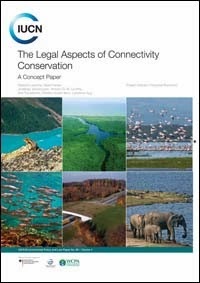 The IUCN recently published a two volume publication titled ‘The Legal Aspects of Connectivity Conservation’ (IUCN 2013). 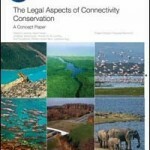 Volume 1 gives a broad overview of current insights and understanding of connectivity conservation and explains through which legal mechanisms connectivity conservation can be achieved, taking examples from around the world, and focusing on land use planning law, development control law, voluntary conservation agreements and economic and market-based instruments. Volume 2 has a wealth of case studies of connectivity projects around the world. These projects range from local or regional projects, to nationwide or even continent wide connectivity projects. Examples of these are the nationwide ecological network in the Netherlands, the 3600km long corridor of the Great Eastern Ranges in Australia, the EU’s Natura 2000 network (including domestic projects in France, Germany, Spain, the UK, Finland and Slovakia) and corridors in Brazil, such as the Central Amazon Corridor. Connectivity conservation and the management of connectivity conservation areas are emerging fields of scientific study and conservation management practice within the broader subject of nature conservation. In the most basic terms, connectivity conservation is a conservation measure in natural areas that are interconnected and in environments that are degraded or fragmented by human impacts and development where the aim is to maintain or restore the integrity of the affected natural ecosystems, linkages between critical habitats for wildlife, and ecological processes important for the goods and services they provide to nature and people. In fragmented ecosystems, wildlife corridors and other natural linkages such as green belts and large wildlife corridors have been common representations of connectivity conservation. The scientific emphasis takes into account connectivity needs across landscapes and seascapes, and in some cases even across continents, where necessary to maintain or restore specific linkages for habitat or species populations, or to maintain or restore important ecosystem processes. Scientific study and conservation practice have made important strides in understanding and applying connectivity conservation across a range of scales and functions. The overarching conclusion from the research and analyses undertaken for this project as presented in Volume 1 of the report is the need for countries to become increasingly alert to their connectivity conservation needs, undertake connectivity planning, and initiate actions using existing mechanisms and opportunities as much as possible to negotiate and protect critical connectivity areas before they are lost to development. To support this process, a related conclusion is that a wide array of different legal instruments and tools already exist in many legal systems to begin to promote and implement science-based connectivity actions in priority landscapes/seascapes and local sites. Countries should start with these tools, using the best scientific information available, before development pressures make conservation or restoration no longer economically or political feasible. As experience is gained working with communities and landholders, and managing for connectivity conservation, a foundation of knowledge and support can be built for amending or enacting new legislation, as needed, to strengthen and integrate connectivity conservation authority into legal frameworks. Opportunities to use existing law and policy instruments should not be delayed by those efforts. It also is important to recognize that the law, by its nature and function, aims for clarity, certainty, and clearly defined processes and criteria for achieving specific goals and objectives. These features are essential for societies to have orderly interactions and effective future planning. In contrast, connectivity conservation is a tool for adapting to change due to dynamic factors related to current and new threats to protected areas, biodiversity and ecosystems, and to global change including climate change. Bringing the law and connectivity together requires that the law incorporate some flexibility in order for management to be able to respond to changing connectivity conservation needs and that connectivity conservation actions be based on the best available scientific information (in both the natural and social sciences) so that management actions and commitments are well founded for the foreseeable future. Law has several mechanisms that can provide flexibility. These include requirements for periodic review and revision of management plans, regular monitoring based on ecological criteria, the development of performance measures to help assess and evaluate whether management plans are achieving their intended purposes, and decision-making mechanisms to monitor and incorporate new scientific information relevant for connectivity conservation management as it becomes available. For Europe, it is clear that Natura 2000 alone does not constitute a coherent network in the sense of truly interconnected protected areas throughout an entire country or throughout the whole of the EU. Additional, domestic instruments, mainly in the field of nature conservation law and spatial planning law are needed to create connectivity between the Natura 2000 sites. Even in case domestic instruments are applied, in addition to the EU’s Natura 2000 legal framework, to achieve connectivity, we still cannot be certain that the network remains just an ecological network on paper. Much depends on the actual application of all the laws and policies on activities within the areas that constitute the network. Farmers and other local landowners have to refrain from harmful activities, and/or have to actively manage the area to support the area’s connectivity function. Financial incentives are needed to make this happen. Fortunately, we can observe that EU Member States increasingly do apply such domestic instruments in order to achieve connectivity. Domestic policies in various Member States, such as the Netherlands and the UK, provide for additional connectivity instruments that add to the Natura 2000 network. Domestic subsidy schemes across the EU exist as well, and the EU’s LIFE+ scheme provide important financial incentives for connectivity. This, however, is largely due to national policy initiatives, and based upon national law instruments. At the EU level, there seems to be a slow movement towards accepting that connectivity measures are legally required by the current texts of the Birds and Habitats Directive. The Alto Sil judgment of the EU Court of Justice (Case C-404/09 European Commission v Spain), as well as a range of policy documents go into that direction. In my view, however, there is much to say for more explicit regulating connectivity (and restoration) requirements in binding legal instruments, such as the EU Habitats Directive. There is a fear that altering the current text of the Habitats Directive will open Pandora’s Box, leading to a decline of the impact of this Directive on nature conservation in Europe. Fear, however, generally is a bad advisor. The Habitats Directive is getting outdated, caught up by climate change and by large scale landscape fragmentation in Europe. Since 2008, civil society groups and transnational networks have drawn attention to one discrete source of conflict that is on the rise in the wake of resource scarcity: transnational agro-investment (Oxfam 2011; GRAIN 2012; FOE 2012). In practice this form of investment revolves around the acquisition of large areas of land, usually located in the global South and on a doubtful legal basis, often labeled as ‘land grab’. Governments of poor states are eager to welcome investments, even though there is no clear sight on beneficial long-term effects of associated changes in land use (FAO, 2012; ILC, 2012). Most contracts for these long-term transactions are effectuated between foreign investments (often government driven) and national governments that control and own the land. Some (not all) foreign investors are driven primarily by reasons that are related to climate change (we can call this ‘climate induced transnational agro-investments’). First, countries that foresee reduced domestic availability of suitable land for food production due to climate change and rapid population growth try to avoid future food shortage and high prices by producing food overseas (China being an example here). Second, most developed countries have set targets in their energy policies in attempts to cap greenhouse emissions. To meet these targets they are searching outside their own jurisdiction for suitable and affordable land to grow crops for biofuels and forestation. There is, however, another link between land grabbing and climate change: intensified land use for the African host countries not only impairs immediate food and water availability at the local level, but also reduces local communities’ resilience to engage with future climate change (hence, reducing their adaptive capacities). This, in turn, leads to serious and often irreversible socio-economic impacts, such as the displacement of local communities. Climate-induced transnational agro-investment has been on the rise in several countries in Africa, such as Ethiopia and Uganda, where large areas of fertile farmland have already been earmarked for long-term transfer to foreign investors. Companies from China, Germany, India, Israel, Pakistan, Saudi Arabia, UAE, UK, The Netherlands, Norway and the USA have concluded land lease agreements for biofuel projects with government. Tensions and conflicts are looming as a result of discontent created by the marginalization and loss of property rights of the local communities as well as lack of their participation and a benefit-sharing scheme for use of resources. There already are numerous instances of displacements of the local population as well as clearing of forests and related resources on which the livelihood of the local population depend. These activities of the investors have caused widespread fear and threats to the livelihood of the local communities and have already led to conflict in some localities. An early example of such a conflict in Uganda is the so called FACE-case. The Forests Absorbing Carbon-dioxide Emissions Foundation (FACE) is a Dutch organization that entered a partnership with Uganda Wildlife Authority (UWA) to carry out a reforestation project in Mount Elgon National Park, commencing in 1994. The project involves planting of trees inside the boundaries of Mount Elgon National Park. The idea was that FACE assists with the planting of 25,000 ha of trees to absorb carbon dioxide so as to offset emissions from a new 600 MW coal-fired power station in the Netherlands. A year before the project started, the government declared Mount Elgon a National Park and the people living within its boundaries lost all their rights. People residing in the designated area were evicted without any compensation, and court cases aimed at protecting the community interests, did not yielded much. This resulted in conflicts, where communities deliberately destroyed the trees in the park. Evictions have continued throughout the 2000s, without compensation. Although there exists an assumption that the investment is legally secured by contract law, pertinent legal questions arise about the compatibility of property rights, environmental norms, human rights and participation rights. In general, five sources of law apply to foreign agro-investment: (a) National law of the host state; (b) Customary law of local and indigenous people; (c) International law (treaty and customary law, e.g. investment law); (d) Social responsibility norms and codes of conducts; (e) National law of the investor’s home state. It is unclear, however, how the legal norms of this complex multilevel system interact in practice. Such legal questions regarding changes in land change within the bigger climate change context have largely escaped the attention of environmental, human rights and investment lawyers to date. Legal analyses of the phenomenon of foreign direct investment and its impact on local communities’ rights are scarce. Moreover, evidence shows that legal entitlements and rights are not evenly distributed. In general it can be stated that while investors’ interests are legally enforceable and thereby protected, the interests of local and indigenous people are mostly regulated by ‘soft norms’- e.g. the principle of free prior and informed consent that in practice is extremely difficult to enforce. As climate change threatens to become an ever more acute and serious problem, and population pressure increases, foreign agro – investment is an increasing source of conflict. This being so, we can no longer postpone thinking about the legal nature and the legal implications of climate-induced foreign agro-investment. One promising legal pathway is to focus on the legal agreements through which long-term land deals are being completed. These contracts or bilateral investment treaties contain critical information that determines the scope and terms of the investment deal, including the distribution of risks among stakeholders. The nature of the parties signing the contract (private or public) and through what process, significantly impacts on the extent to which local communities are involved and can make their voices heard. Practice suggests that local communities and rural landowners are rarely consulted in negotiations. Likewise, the terms of the contracts could have profound and possibly irreversible consequences for food security and stability in the host countries. It is hence crucial that contractual arrangements also address both environmental and social issues (e.g. job creation, infrastructure development). This is an area where linking contract law to customary, national, and international law and codes of conduct is particularly important for a full understanding of the implications of the contracts. Recently, several codes of conduct and principles for responsible investment (e.g. World Bank, FAO, IFAD, the UNCTAD, OECD, IFC standards, Ruggie Principles in Responsible Contracts, etc.) have been added at the international level to the existing body of law regulating foreign agro-investments. Similarly, at the regional level there has been increasing activity concerning promoting responsible investment; the African Land Policy Framework and Guidelines Initiative that is being led by the African Union for example addresses the issue. However, how these soft norms relate to individual contracts is far from clear and needs to be explored. It appears that domestic practices throughout Africa are quite diverse, ranging from no relationship whatsoever, to, for example, an explicit coverage of responsible and sustainable investment clauses in all contracts and the duty to have each contract ratified by parliament, as is the case in Liberia. Zambia has largely regulated foreign agro-investments, with the aim to guaranteeing continued supply at fair prices to local markets and the use of local farmers who have to earn a decent salary. A search for best practices in Africa is a good way to start researching effective regulatory frameworks for responsible and sustainable transnational agro-investments!